> Not yet, but soon. 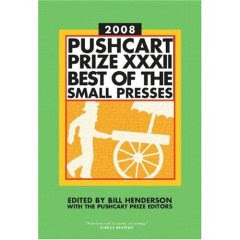 It was about a year ago that I presented the last edition of my Pushcart Prize List, a ranking of literary magazines based on a formula that includes Pushcart Prizes and Special Mentions since 2001. I use the list to help me prioritize my submissions to magazines and it proved a popular feature on this blog. I don’t know when my copy of the new Puschart Prize volume will arrive, though (Amazon estimates mid-December), so I won’t be able to do the new list for a few weeks. I’ll post it as soon as I can! >I get really confused by all this, so please forgive me if this is a lame question, but: Pushcart Prize 2008 will feature stuff that was nominated before last December, right? And the stuff nominated before this December will be in Pushcart Prize 2009? >Right. The dates are weird. The 2008 volume has stories published in 2006, and I imagine they date it that way so people won’t think they’re buying last year’s (or the one before) book.